The violence in the world is overwhelming, but as Pirke Avot teaches, “though we may not need to complete all of the work, we are not free to abstain from it.” So I continue to try to make a difference to reduce gun violence and increase gun safety. 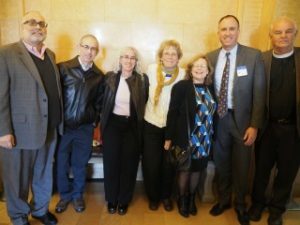 Monday, I traveled to Trenton with Bob Singer and other members of NJ Together (and Metro IAF’s Do Not Stand Idly By Campaign). 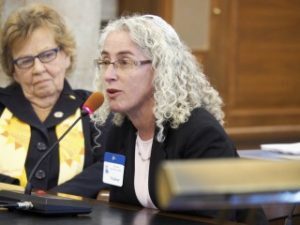 Senator Loretta Weinberg introduced Senate Bill S3249 which amends an earlier bill (from 2002) on child-proof handguns. The original legislation includes a mandate that as soon as a smart gun is sold anywhere in America, ALL hand guns sold in NJ would have to be smart guns within three years. The new legislation changes the mandate to NJ stores to sell at least one brand of smart guns within three years of a smart gun being sold anywhere in the country. The new bill’s goal is to allow the emerging smart-gun technology to succeed in the marketplace. I testified before the Senate Law and Public Safety Committee to support gun-safety, gun sanity. Thank you Senator Loretta Weinberg for sponsoring this new version of the child proof/smart gun bill. The committee acted favorably so the bill now will go to the full Senate. A smart gun can only be used by its authorized user. Imagine a smart gun (registered to another user) in the hands of a suicidal teenager, child’s playmate or convict. Smart guns can save lives.